Carrots… some people love ’em and others, well, not so much. This recipe could actually convert those opposed to the orange veggie. And, besides the obvious benefits to eyesight, carrots have many other health pluses, like lowering cholesterol and preventing heart attacks and cancer. So, try out this super-simple recipe that is not only delicious, but adds to your overall good health! As I’ve mentioned earlier, I prefer steaming vegetables as opposed to boiling them in order to get as many of the nutrients as possible. But, feel free to cook the carrots however you like. 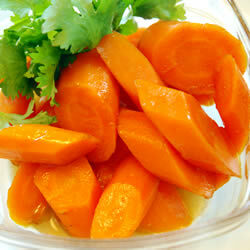 Once your carrots are cooked, put them in a pan with the butter (melted) and brown sugar. Toss them around so they are coated. Continue to cook them on low heat for about 5-10 minutes, depending on how soft you like them. This entry was posted in Recipes, Side Dishes, Vegetarian. Bookmark the permalink.